The Diocese of Sydney, Australia and New Zealand, headquartered in Sydney, is a diocese of the Russian Orthodox Church Outside Russia. Its current primate is His Eminence Hilarion (Kapral), both First Hierarch of ROCOR and Archbishop of Sydney, Australia and New Zealand, and it has been administered by His Grace George (Schaefer), Bishop of Canberra, since 2015. The first Russian parish established in Australia and New Zealand was St. Nicholas Church (now Cathedral), Brisbane, in 1926. The first ROCOR bishop of Australia and New Zealand was Bp Theodore (Rafalsky), 1948-55. The Diocese of Australia and New Zealand is a diocese within the Russian Orthodox Church Outside Russia. Within the diocese, of which Metropolitan Hilarion is currently the head and sole bishop, there are various deans who are in charge of one or more geographic areas. There are approx. 62 parishes, missions and communities in the diocese, including 17 monasteries and sketes: with 28 parishes and missions across Australia, 26 in Indonesia, 4 in New Zealand, one parish & skete in South Korea, and one parish each in Pakistan and India. The Diocese of Australia and New Zealand of the Russian Orthodox Church Outside Russia was a founding member of SCCOCA, but later departed. Metropolitan Hilarion (Kapral) of New York and Eastern America, Archbishop of Sydney, Australia and New Zealand. Bishop George (Schaefer), Bishop of Canberra, Vicar Bishop of the Diocese of Australia and New Zealand. Archimandrite Daniel (Bambang Dwi Byantoro), head of the Indonesian Orthodox mission (ROCOR) (26 parishes and missions). Priest Paul (Kang), head of the Korean Orthodox Mission (1 parish). Bishop Theodore (Rafalsky) of Sydney, 1948-1955. Bishop Philaret (Voznesensky) of Brisbane, 1963-1964. Bishop Sava (Rayevsky) of Sydney, 1955-1971. Bishop Constantine (Essensky) of Brisbane, 1967-1976. Archbishop Theodosius (Putilin) of Sydney, 1970-1980. Archbishop Paul (Pavlov) of Sydney, Australia and New Zealand, 1980-1995. Bishop Gabriel (Chemodakov) of Brisbane, 1996-1997. 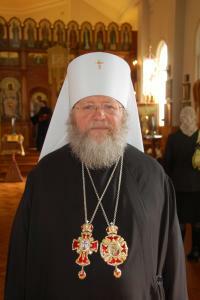 Metropolitan Hilarion (Kapral), Archbishop of Sydney, Australia and New Zealand, 1996-present. Bishop George (Schaefer), Bishop of Canberra, 2015-present. This page was last edited on June 1, 2018, at 02:37. This page has been accessed 55,818 times.